Reviving knocked or “down-but-not-out” teammates is a staple of many battle royales, but Apex Legends allows you to go a step further and respawn eliminated teammates, bringing them back from the dead. But there a few things to bear in mind when it comes to reviving and respawning allies, so to that end our Apex Legends reviving and respawning guide will walk you through everything you need to know to keep you teammates in the fight for as long as possible. While you’re here, why don’t you check out our main Apex Legends tips/guide? Our ever-expanding guides series will explain all Apex Legends’ overlapping systems to newer players, and also introduce you to more advanced and focused tips and info. We’ve also got links to other useful pages such as our Apex Legends characters guide, our detailed stats and spray patterns on all the Apex Legends guns/weapons and accompanying Apex Legends attachments, and much more. There’s a fair amount to cover with our Apex Legends reviving and respawning guide: not only do we explain how to revive and to respawn teammates in varying states of dead, but we also go through some useful tips such as turning the revive and respawn icons transparent, and how to self-revive under certain circumstances. Click on any of the links below to be brought directly to a guide section of your choice. In Apex Legends, much like in other squad-based battle royales, if you’re brought to zero Health but you have a teammate still living, you’ll be “knocked down” (or simply “knocked”, or “downed” – I know, gaming nomenclature is outstandingly creative). While knocked, you cannot act except to crawl around and open or close doors – and to ping, so be sure to keep the lines of communication open even when you’re knocked! If you’re knocked, you will slowly bleed out over the next 90 seconds. If you are not revived in time, or an enemy executes you, then you will be eliminated – but unlike in battle royales such as Fortnite or PUBG, you still have a chance to re-enter the fight later on provided one of your teammates survives to respawn you. Reviving a knocked teammate is simple. All you need to do is stand next to the downed teammate, and hold your Interact key (default “E”) to bring up a progress bar which will quickly fill up over the next 7 seconds (less time if you’re playing as Lifeline, who can revive downed teammates faster and protect them behind an impenetrable shield as you do so!). Once the bar is full, the teammate will be brought back into the fight with a small portion of their maximum health. That’s all there is to it! Be warned however: you cannot act while reviving a teammate. So if an enemy threatens you while you are reviving, you will need to let go of Interact in order to defend yourself, which will reset the progress bar. If an ally is eliminated by an enemy, they will leave behind a crate containing their gear and – very importantly – a banner. Taking an ally’s banner is what enables you to potentially bring your fallen teammate back from the dead. You need to be quick, however, because a teammate’s banner will only hang around for 90 seconds after they have died. If you fail to retrieve their banner in this time, you – and they – are outta luck. To respawn a killed squadmate, you will need to bring their banner to a Respawn Beacon. These Respawn Beacons are scattered across the map, and look like chunky red tripods with a hologram appearing out of their tops. They are not randomly placed each match, so you can learn the locations of each Beacon as you play more matches and learn the ins and outs of Apex Legends’ map. Click this image to view it at highest resolution. To use a Respawn Beacon, walk up to it and hold the Interact key (default “E”), just like when reviving a knocked teammate. This will start the process of placing the banner into the Beacon. This process takes 7 seconds, just like reviving a knocked teammate, but this time, you are able to look around while you hold the Interact button. However, you still can’t move or shoot without interrupting the respawn’s progress. After you’ve completed the respawn, your long-lost teammate(s) will be healed back to 100 health, and brought to you over the next few seconds via droppod. Bear in mind that this calls attention to your location for any who see it, so be sure you’re alone before you commit to reviving an ally! One little known fact about using Respawn Beacons – if either if your teammates picked up your Banner, then either teammate can use a Respawn Beacon to revive you – it doesn’t have to be the player that picked up the Banner! Just a useful little fact that might save your whole team one day. It’s important to remember that allies respawned using a Respawn Beacon do not keep any of their previous gear, so in effect they’re starting the match again, and must search for weapons and other equipment in order to be of any use. You can help speed this process along by helping them out, and possibly even handing them your second weapon so they can at least defend themselves until you both get adequate gear once more. Bear in mind, however, that you cannot hold extra weapons in your inventory, so you won’t be able to keep both your allies weapons and your own on your person until they’re revived. I thought I’d throw this tip into the mix, because this issue plagued me for many weeks before I learnt how to do something about it. When a teammate is knocked or killed, an icon will appear on your HUD to show you where they are and what state they’re in; red if they’re knocked, and green if they’ve been eliminated. Which is useful, except that the icons are large and opaque, and completely obscure enemies that may be on or around your teammate’s body. I’ve died several times over my hundreds of hours due to this issue of enemies being hidden behind these icons. Fortuntately, there is a fix. Go into your Settings, and under the Gameplay tab, set Ping Opacity to Faded. This affects both Ping markers and revival/respawn markers, turning them transparent when you look directly at them. No more enemies hiding behind icons! You may have heard players saying that it’s possible to revive yourself from the knocked state without a teammate’s assistance. Well, it’s true, but you need a very specific piece of gear: a Legendary (gold-coloured) Knockdown Shield. With this rare piece of kit, you can not only protect yourself with a shield as per ordinary Knockdown Shields, but you can actually revive yourself over time in the same way as a teammate would revive you. Be aware that this takes time, so you need to be in a safe location; and you can only do it once, after which the Gold Knockdown Shield becomes, for all intents and purposes, an ordinary Purple Knockdown Shield. For tonnes more information on all the gear and legendary items in the game, take a look at our Apex Legends Armor and Gear guide. 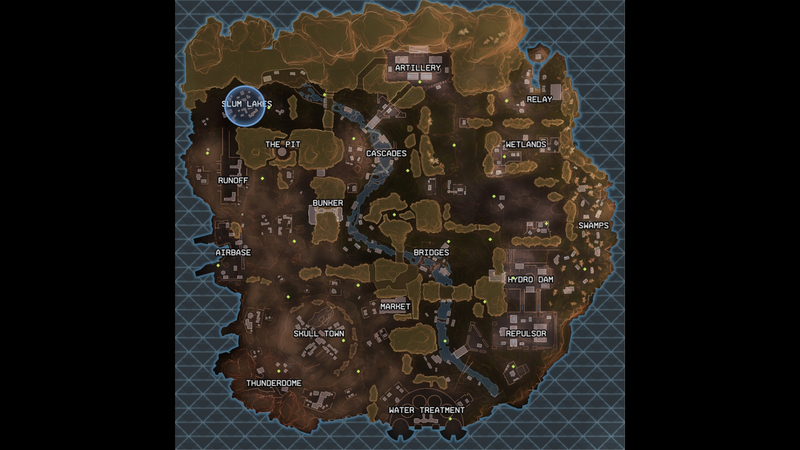 Hopefully this guide has helped those who were struggling to wrap their heads around the in-depth reviving and respawning systems of Apex Legends. Now get out there and get reviving! Your teammates need you!